CHAIRMAN GREENSPAN. … Would somebody like to move approval of the minutes of the May 6 meeting? 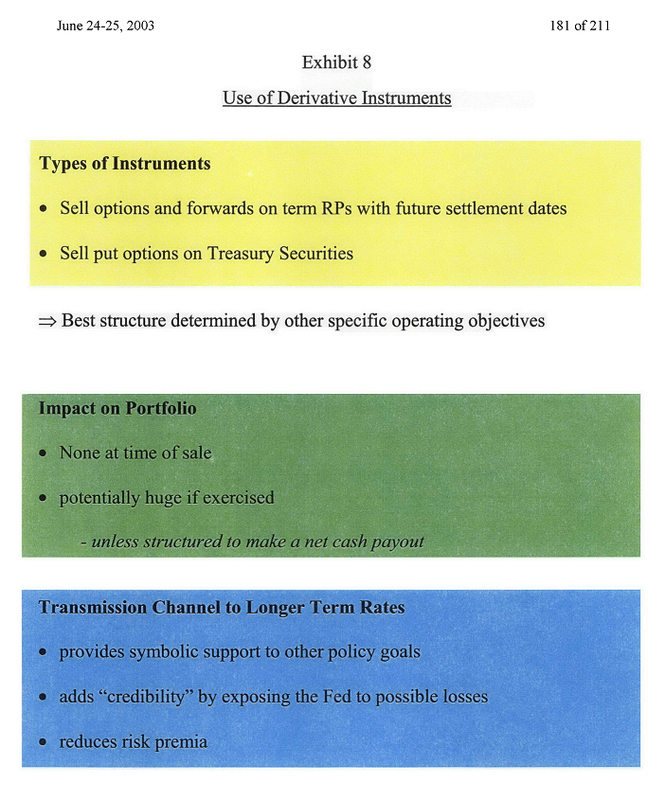 The Committee could sanction the use of various derivative instruments on conventional Desk operations as a way to influence longer-term yields, which is outlined in exhibit 8. Options of some form are a possibility, as are forward operations. For example, we could sell a sequence of options on term RPs, covering interlocking time segments that collectively extend as far into the future as desired. In this way, longer-term yields could be influenced and a visible signal of the Fed' s desired path of interest rates could be demonstrated. Forward operations in term RPs could be structured in a similar fashion. Alternatively, we could sell put options on longer-term Treasury securities at strike prices associated with desired longer-term yields. Of course, the operating objectives set for the sale of derivative instruments would determine their proper structure and should be carefully formulated first. I' ll come back to this subject after going through some of the logistical issues. I' m also going to focus primarily on options for RPs specifically, as these have certain advantages over forward operations for the kinds of policy purposes under consideration. Of course, a successful program would be one in which any options sold would never be exercised. Achieving this result, just as with interest rate ceilings, would depend on how well the characteristics of the options—the strike price and the expiration dates—corresponded to market expectations for future rates. In this regard, options on RPs with the Desk have a strong advantage over, say, options on Treasury yields because the policy rate over which the Committee has direct influence could be more directly linked to shorter term RPs than to longer-term Treasury yields. For these same reasons, options on Desk RPs could be structured to correspond directly with a policy commitment on the path of future short-term rates, and they could be effective through one of several channels. First, even a relatively small program would undoubtedly add symbolic weight. Second, they would represent a monetary cost to the Federal Reserve of deviating from the implied path of future short-term rates, which might be seen as further binding the Committee to that path. For this effect, the more options sold the better. Third, a large volume of options sold could reduce risk premiums embedded in longer-term rates, independent of the level of credibility about any policy commitment. Here too, the more sold the more effective. As with interest rate ceilings, the question could be asked how effective the sale of options, either on Desk RPs or Treasury securities, would by itself be in reducing longer-term yields. No doubt, an initial impact would be felt. But ultimate success would hinge on the quantity of options sold—that is, how big a bet the Federal Reserve were willing to make. The more options sold, the greater the chance they would have the desired effect on longer-term rates even if not associated with any policy commitment, either by raising the costs to the Fed associated with options being exercised, or by lowering risk premiums on longer-term rates. But of course the risks to the portfolio, to reserve levels, and of capital losses would rise in equal measure. And an exit strategy for options may not be as straightforward as it seems, even apart from the possibility of their being exercised. Of course, the Desk could stop auctioning new options at any time. But a decision to stop selling more options or not to issue new contracts with later expiration dates as time passes likely would be interpreted in the market as a statement about future policy intentions. The resulting rush to unwind market positions would likely be very disruptive and send yields sharply higher. I' ll conclude by making a few summary observations, which are outlined in exhibit 11. In terms of our being able to achieve the narrow operating objectives that might be set for us, there seems little doubt that we could be successful, with the possible exception of explicit ceilings on longer-term Treasury yields. 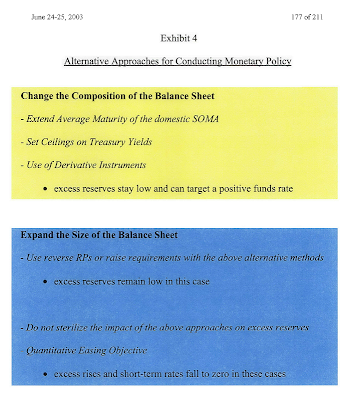 But many of these alternative approaches would have as an implicit intermediate objective a reduction in longer-term Treasury yields; and in the case of rate ceilings, this would be the explicit operating target. While our ability to change the composition and size of our domestic portfolio measured in absolute terms is undoubtedly huge, it is still questionable how sizable and durable an effect Desk operations alone would have on relative market-determined rates. As Vincent noted, however, changes in market expectations about future short-term policy rates can have a profound effect on longer-term yields without any adjustment to the central bank' s balance sheet. Such changes could be induced by a communications strategy to shape interest rate expectations. The tactical approaches I have described could very effectively reinforce some form of communication about the future stance of policy. For purposes of shaping market expectations about future short-term rates, however, it is unlikely that the adoption of any of these alternative operating approaches by themselves would be an adequate substitute for some clear communication coming from the Committee. Finally, all the approaches that I have described raise issues about exit strategies, coordination with Treasury debt management, and potential for capital losses, some of which I have mentioned. But in general, it seems that concerns associated with these issues would be greater if we were relying on changes in the composition and size of SOMA holdings to be the primary channel through which we were trying to influence longer-term yields. Thank you. MR. REINHART. At this point, the staff is seeking guidance from the Committee on how to proceed. In particular, we will be listening especially intently to your discussion this afternoon for answers to the four questions highlighted in exhibit 9, the very last chart in my package. First, are there any alternatives that the Committee particularly favors for additional study? Second, are there any alternatives that should be dropped immediately from consideration? Third, how does the Committee assess the costs of very low nominal overnight interest rates, and are they such that an alternative policy should be put in place at a funds rate above zero? Finally, how should the Committee' s assessment of these policy alternatives be conveyed to the public in the months ahead? The New York Fed reports on its website that the Federal Reserve does not engage in derivative transactions. In recent years, the Federal Reserve and the Treasury have made their interventions more transparent. Thus, the New York Fed often deals directly with many large interbank dealers simultaneously to buy and sell currencies in the spot exchange rate market. The Fed historically has not engaged in forward or other derivative transactions [This is a lie!]. The Treasury Secretary typically confirms U.S. intervention while the Fed is conducting the operation or shortly thereafter. Often, statements that reflect the official U.S. stance on its exchange rate policy accompany the Treasury's confirmation of intervention activity. My reaction: I stumbled on this Fed transcript last night. I can' t believe the Federal Reserve published something so damning to itself! 1) The Federal Reserve sold options on repos in 1999 that totaled nearly $0.5 trillion of notional value. 2) According to the Federal Reserve' s website: The Fed historically has not engaged in forward or other derivative transactions. The Fed is lying! 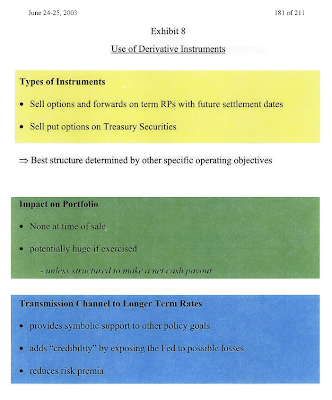 3) Auctioning derivatives is something the Federal Reserve' s Trading Desk in 2003 already had experience doing. 4) In June 2003, The Federal Reserve was contemplating selling massive quantity of options sold to reduce risk premiums embedded in longer-term interest rates. 5) If the Federal Reserve did sell those options (and they probably did), the unwinding of the Fed' s derivative positions will likely be very disruptive and send yields sharply higher. Conclusion: This is proof positive that the Federal Reserve has been abusing derivatives on a dangerous scale since at least 1999. This entry was posted in Background_Info, Federal_Reserve, Financial_Wizardry. Bookmark the permalink. Still working on EuroCCP entry. Will be done later today. I'm very keen to read it :-) Especially now that the germans have pretty much confirmed everything you've been saying. One thing I find particularly surprising about the tone of many of the news reports is that they seem to imply that there's nothing at all wrong with naked short selling and germany is 'panicing' and generally behaving irrationally in trying to stop it. Also in the off chance that any germany central bankers are reading this -- why don't you consider using bundesbank reserves to cause a short squeeze somewhere? Buy a lot of something and demand delivery. That'll put a stop to the naked short selling in a hurry - they'll be screaming murder. Remember what happened with the Porsche / VW debacle. Change the law to allow building of large long positions without disclosure - it *is* fair - dont' let the naughty shorts tell you it isn't. What I found most interesting in the minutes was their consideration of selling options on longer term Treasurys. I for one remember a little prediction by Eric that come May / June timeframe some utter collapse would occur in soybean futures... or something or other. Some big explosion in price and shortages in delivery. Correct, we will know by the end of June whether I am right or not. Good stuff Eric - your site gives me chills. In your various research have you ever come across any info re foreign troops on US soil? fascinating. it appears that options sold on rp's were selected because the level o rp is determined by the Fed while treasury rates are not. In other words the Fed could be short premium (options) and not run the risk of exercise because the rp would never be priced to settle against the sale.